After finishing two years at the University of Wisconsin, Oshkosh and receiving a B.F.A. 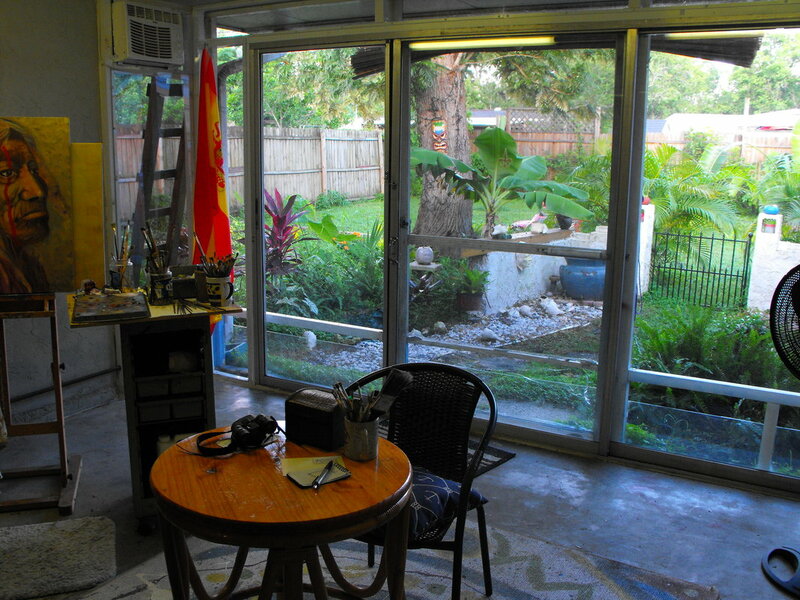 from the Ringling School of Art in Sarasota in 1972, I worked as a commercial artist for local advertising agencies. After fifteen years, this occupation turned out to be very unfullfilling and I began pursuing interesting freelance design work. Some of my projects included designing book covers for the University of Wisconsin Press, Ohio State University Press, and a few other universities. I also created drawings for a local in archaeological survey company. I found this work much more stimulating and eventually began doing freelance work exclusively. While not as financially rewarding as my “day job” had been, the biggest benefit of being my own boss was having enough time to pursue my other passion—history. I started studying Florida history intensely. The history of the early Florida Indians intrigued me because their cultures were so violently destroyed and in less than two hundred years. Perhaps serving as a combat medic in the historic Seventh Calvary in Vietnam in 1968, made me relate on a personal level to the incomprehensible deaths of native men, women, and children by European military conquest, disease, and slavery. Anyway, I wanted to do something with my life that had meaning, so I decided to use paint on canvas to bring back these early native peoples whose images and lifestyles were grossly misrepresented for so long in history books and other chronicles of Florida’s early days. I combined my passions for art and for history to resurrect the earliest Florida natives so that they can be accurately understood. While I cannot change history and right the wrongs that drove these Indians into extinction, through my paintings I honor their memories and help set the record straight. I would like to thank all the archaeologists and historians that spent countless hours critiquing my work and providing me with many important and helpful drawings and photographs. Watch on The Archaeology Channel web site. 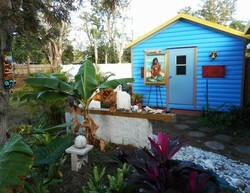 ​This video shows the artist at work painting a Calusa wood carver. My lifelong passion was for art and history. 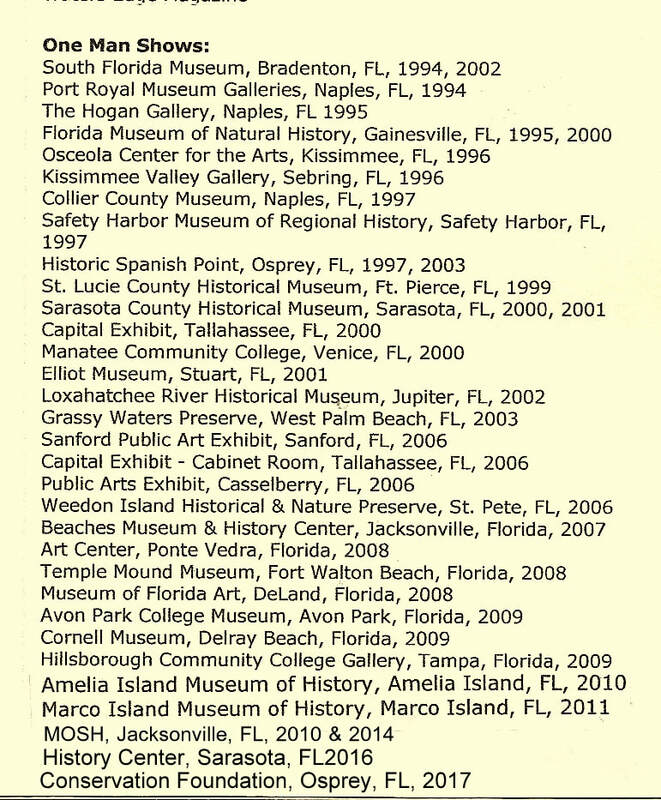 When in 1988, I first started researching Florida history, I joined Time Sifters Archaeology Society, a Sarasota group that held monthly meetings and organized archaeological digs in the area. Here I got to know George Luer, a very respected archaeologist who is totally dedicated to preserving Florida's heritage. I learned how important it was to protect Indian sites from looters. With the destruction of archaeological sites, the people of Florida lose some of their very valuable heritage. In 1995, Luer and I collaborated on a poster to benefit the Florida Anthropological Society. We decided the design should include a few of the main tribes and a large line drawing of an Apalachee Bird Man Dancer. This was not an easy task. 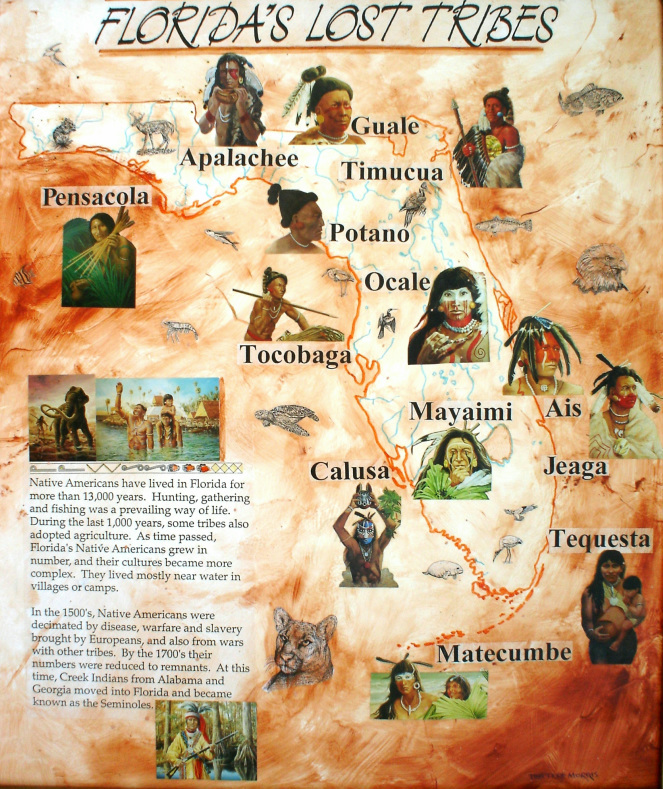 The history of Florida's first peoples have been distorted and misrepresented for hundreds of years. A book showing Timucua people in 1564, drawn by Jacques le Moyne and engraved by Theodore de Bry in 1595, portray the Timucua as European-looking people from the16th century. My research for the poster, at the local library, turned up very little information and no accurate images. One day I walked by the poster and wondered what the drawing would look like as a full color painting. At the time I was doing freelance commercial design so I had extra time to pursue this idea. I decided to paint portraits as opposed to tribal scenes because I wanted to introduce these tribal people to the viewer on a personal level. 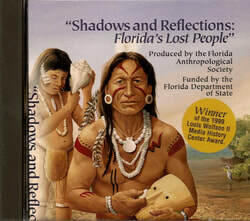 I decided to make these people human and not an idealized romantic image, I used photographs of artifacts that were found in the different areas of Florida to determine tribal locations. I then embarked on a solitary voyage of discovery. Painting these people has become like a meditative experience with the present dissolving into the past. I want my paintings to move the viewer to reflect on the past and present. Many of the portraits in my paintings look directly out at the viewer in a confrontational manner as if to say “I'm a human being as are you”.